Enhance the professional appeal of your documentation and reduce time spent on repetitive tasks with TranSource custom stamps. No matter how specific the message, TranSource can create a stamp that communicates it clearly and quickly. TranSource offers the flexibility to combine messages on one stamp, such as an endorsement stamp that includes an additional line for a driver's license number. What's more, all TranSource stamps are designed with laser technology that provides precision stamp detail and expedites delivery. Fully customizable and available in multiple sizes and shapes. Make thousands of impressions without re-inking! Self-inking stamps are an excellent choice for your high volume stamping needs. 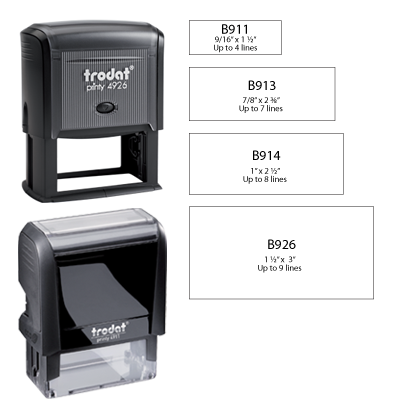 Our self-inking stamps work and feel as great as they look. Their numerous patented features make them a pleasure to use. Just one impression and you will appreciate the ergonomic shape and heavy duty construction.